You’ve brought your new tiny baby back home. You’ve survived childbirth (you rock!). Now for the simple task of figuring it out…parenting! Don’t worry, you got this! and we’re here to help. 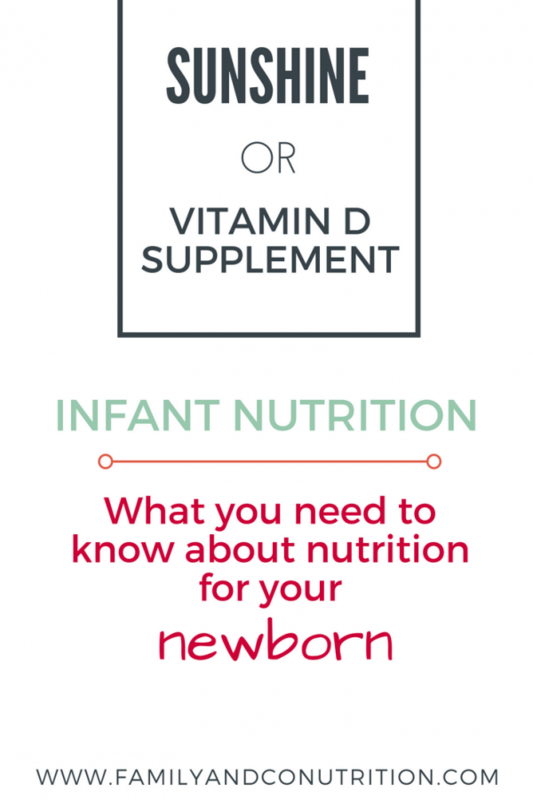 Let’s start with an important nutrition tip: give your infant vitamin D drops. Is your baby exclusively breastfed? 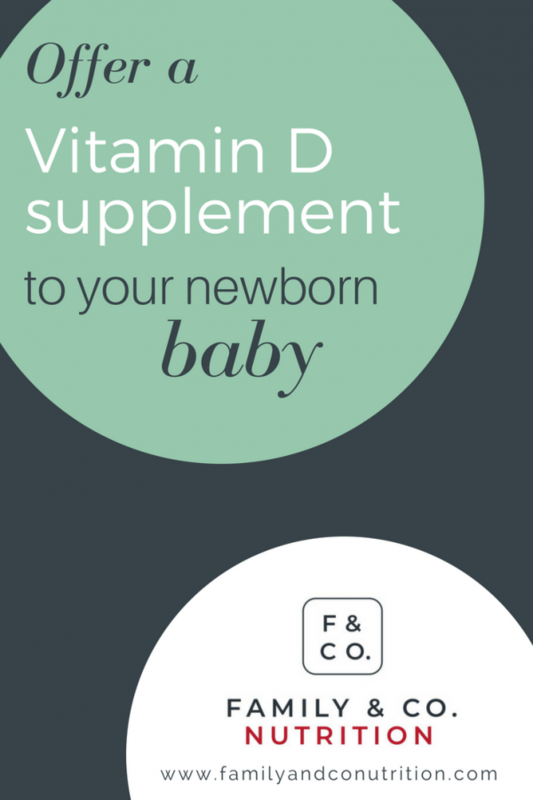 Your baby will need to receive 400IU of vitamin D everyday. Breastmilk doesn’t contain enough vitamin D to ensure adequate status for baby. Did you know? breastmilk vitamin D content depends on mothers? That’s right, mom’s own vitamin D status can fluctuate by season and affect how much vitamin D her infant gets. Vitamin D drops for infants providing 400IU/day vitamin D is recommended. Is you baby formula fed? Formula contains about 100IU of vitamin D per 8oz. To get the recommended 400 IU per day, your baby needs to drink 32oz of formula over 24 hours. What would this look like in a practical sense? It’s the equivalent of 8 bottles of 4 oz each for example. 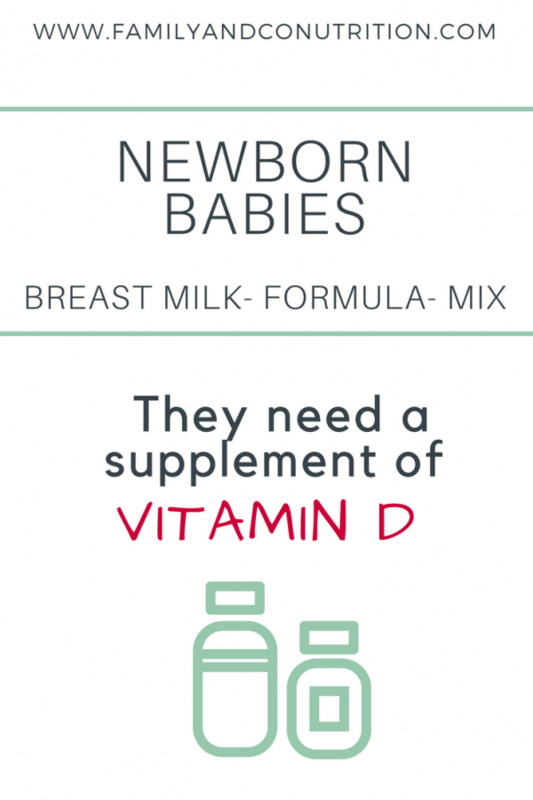 If your baby is drinking less than that volume, they will need a supplement of vitamin D drops for infants. 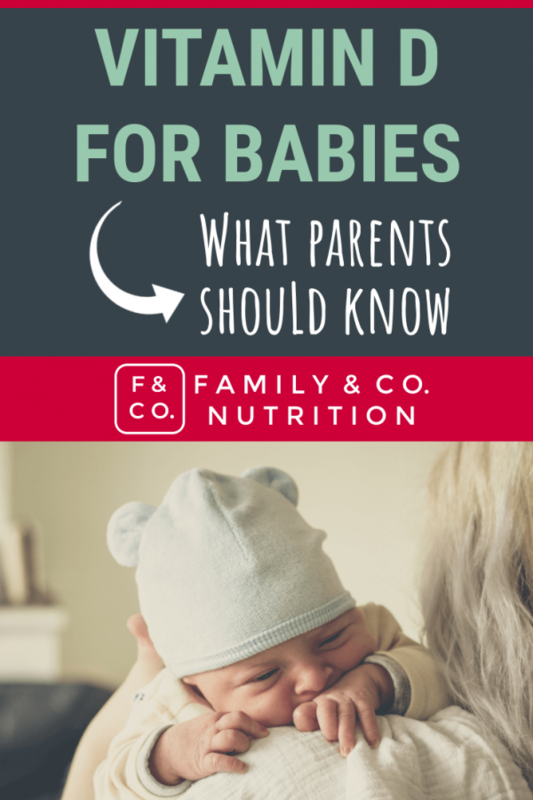 Is your baby mixed fed (breastmilk + formula)? Mix feeding is likely not going to provide baby enough vitamin D.
Why not? Breast milk has very little vitamin D, and its unlikely baby drinks 32oz of formula on top of breast milk. In short, play it safe and offer an infant vitamin D drop supplement providing 400IU everyday. For most infants, we recommend a 400 IU/day vitamin D drops supplement. 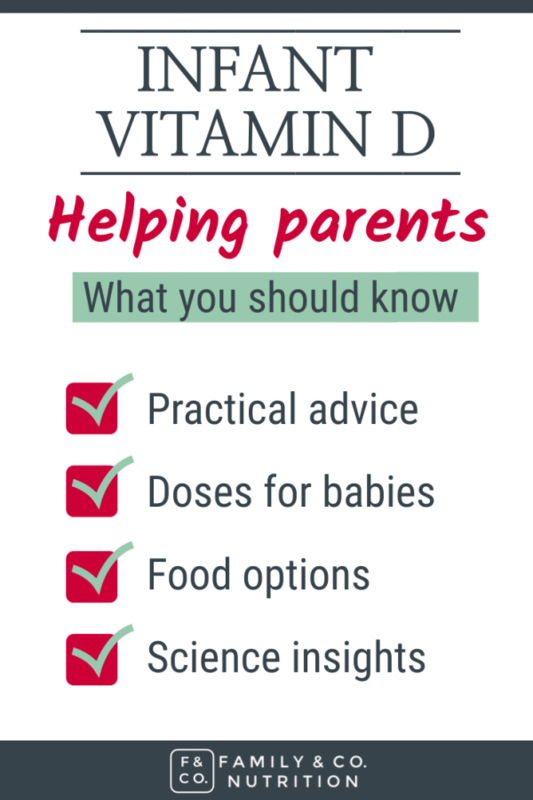 Sunshine vitamin: can my baby produce vitamin D if exposed to the sun? Our bodies are able to produce vitamin D with exposure to the UVB rays of the sun. But it is not recommended to expose young infants to the sun because their skin is thin and fragile. Applying sunscreen to infants that young isn’t recommended either. Yes, even though it protects against UVB rays. Instead, stick to vitamin D drops for infants to ensure your baby gets enough daily. Vitamin D helps the absorption of calcium, and because calcium is the predominant building block of the skeleton, vitamin D is necessary for strong bones and teeth. There are 2 types of vitamin D in our food chain : vitamin D2 and vitamin D3. Vitamin D2 is obtained from plant-based sources while vitamin D3 is obtained from animal-based sources. Most of our food sources are vitamin D3, like fatty fish, egg yolk, milk (mandatory fortified in Canada), and other fortified foods. Both vitamin D2 and vitamin D3 are adequate to raise baby’s blood vitamin D concentration. 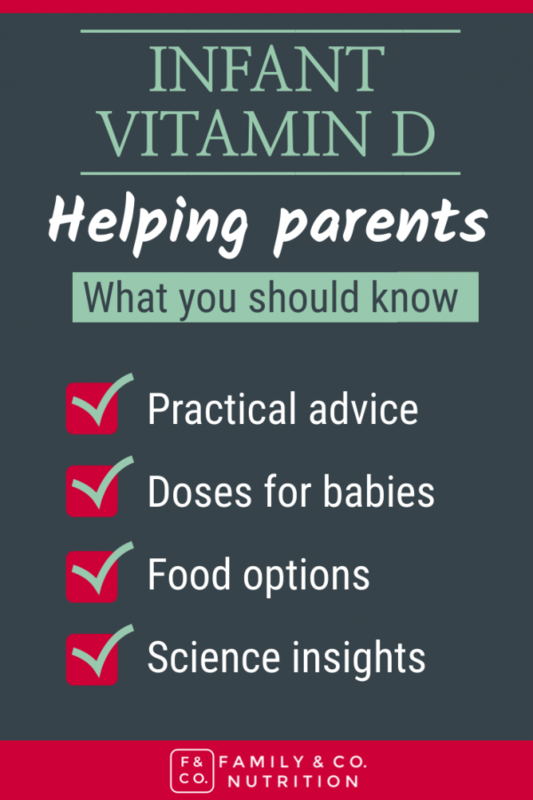 How much vitamin D should I give my infant? Health Canada recommends to give 400 IU of vitamin D per day. This amount is enough to maintain bone health and calcium metabolism in infants. 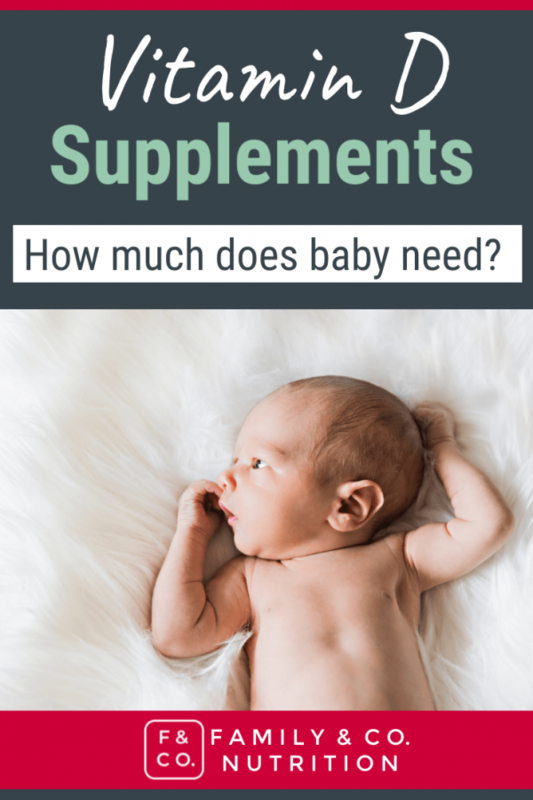 Look on the bottle of the supplement you bought to know how much to give to baby. Most vitamin D drops for infants are in liquid form. You dispense the supplement using a dropper. Droppers generally release one drop at a time, or a pre-dosed amount. Either way, take the time to read the supplement label to ensure you know the right dose. This helps make sure your infant will get 400 IU/day of vitamin D.
Vitamin D supplements for older kids and adults often contain higher doses, up to 1 000 IU/dose. We recommend buying vitamin D drops for infants, to ensure appropriate dosage. It makes things easier for new and sleep-deprived parents. Also, only buy supplements with a Drug Identification Number (DIN) or a Natural Product Number (NPN). 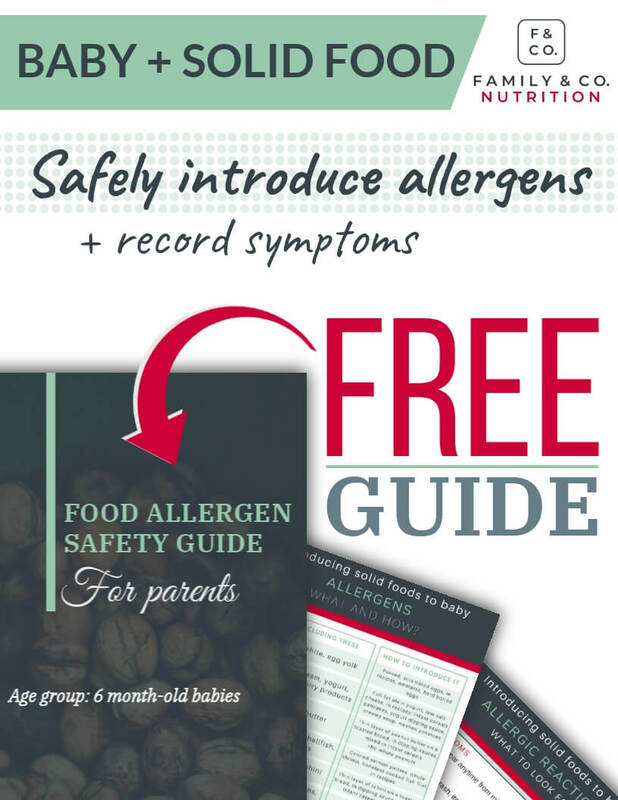 These registration numbers are only assigned to products reviewed by Health Canada. 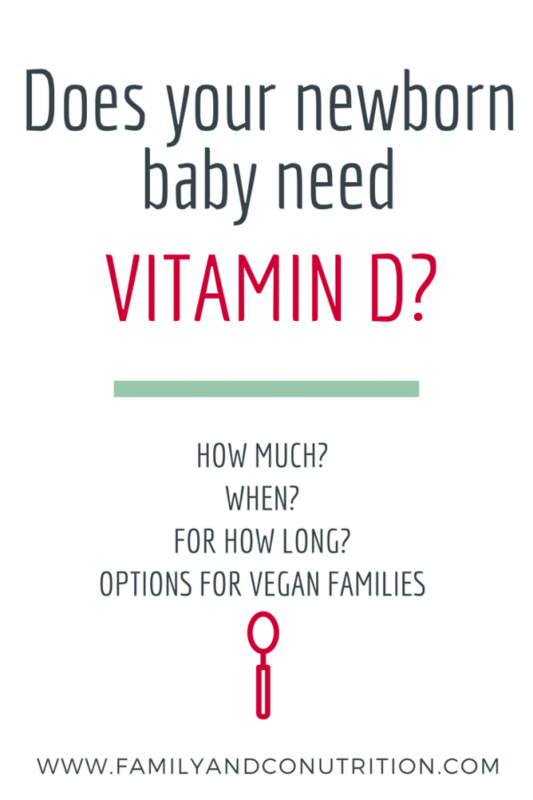 Baby needs a supplement of 400IU/d of vitamin D. Read the supplement bottle to understand how to give that dose. I forgot to give my infant a vitamin D drops! It’s okay if you forget most days, or you didn’t know to supplement your baby. Sometimes a complicated birth experience can leave you worrying about other things. Again, it is okay! Start now. Offer a supplement today to your baby and continue to give it daily. Vitamin D is essential in calcium absorption and metabolism. Vitamin D deficient infants can develop problems that are difficult to reverse. Examples include: weak tooth enamel, fragile bones, slow growth, and a delay in closing of the soft spot on the head, etc. So, sometimes forgetting to offer vitamin D drops isn’t the end of the world. But these points highlight the importance of vitamin D recommendations! Some folks (perhaps even your parents! ), swear that they didn’t give vitamin D drops to their infants. Heck, they all grew up fine, right? Well, nutrition science has since evolved, so why not reap the benefits? Use an alarm or a daily reminder in your calendar, nothing like a beeping phone to keep you on top of it! The challenging part is to remember to give the supplement to baby everyday! Can mom take vitamin D instead of baby? In theory yes, but in practice not really. First, it would be relevant only for mothers who breastfeed. One randomized controlled trial in the USA has looked at this idea. Researchers studied the effect of supplementing mothers instead of infants in the first 7 months. Mothers either gave their infants a 400IU/d supplement of vitamin D drops, or themselves took a 6,400IU/d. All mothers were exclusively breastfeeding regardless of the supplementation strategy. Researchers found both methods led to adequate vitamin D status in the infant for the first 7 months. But! it also caused very high vitamin D concentration in the baby’s blood. The dose mothers consumed (6,400IU/d) was over 3 times higher than the maximal daily dose set by Health Canada. There were no reported toxic effects from the supplementation however. These results highlight the difficulty in relying on maternal supplementation. It may not ensure adequate vitamin D status in the infant. Also, it creates the problem of mother’s needing to remember to take their supplement. Mother’s should focus on consuming a balanced plate of food, most meals, most days. It seems safer to supplement babies with moderate doses of vitamin D drops. Vitamin D supplements are usually made of vitamin D3. It is generally extracted from lanolin which comes from sheep wool. It is not vegetarian nor vegan. Whereas, vitamin D2 comes from plants and is always vegetarian and vegan friendly. Which is better? 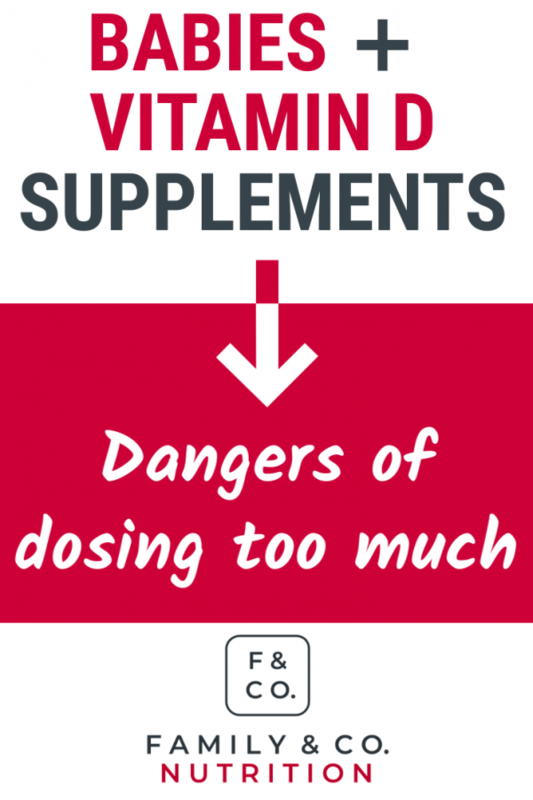 Current research shows vitamin D2 is less potent than D3 in raising vitamin D blood concentration. But vitamin D2 still works. You may need a bit more vitamin D2 to get the same benefits as with vitamin D3. For vegetarian and vegan parents that prefer a vitamin D3 drop, there are now some options on the market. Supplements companies keep innovating. A novel way of manufacturing vegan vitamin D3 is to extract it from lichen! Lichen is an algae (source of vitamin D3) living with a mushroom (source of D2), and they cultivate it in large amounts. Companies like Nordic Naturals (0.5ml=1000 IU vitamin D3) and Vitashine (1 spray = 200IU vitamin D3) offer vegan vitamin D3 supplements extracted from lichen. If you choose one of these supplements, check the dosing so your baby receives 400 IU everyday. 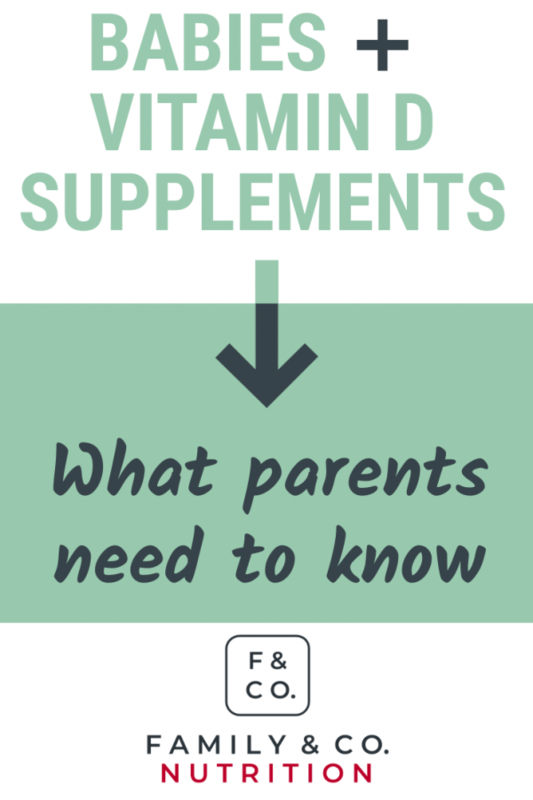 Otherwise, vegetarians and vegan parents can offer a supplement of vitamin D2. The company Pure-le Natural offers vegan vitamin D2 supplement for infants (400 IU/drop). 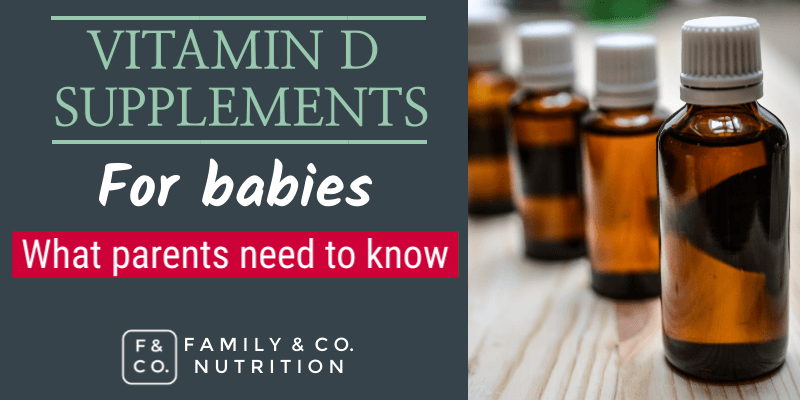 The company D drops offers a vegan vitamin D2 supplement, but 1 drop = 1000 IU, which is too much for infants. If parents chose this supplement, offer baby one drop every 3 days. Companies keep innovating to offer products that align with their needs and values. Vegans and vegetarian parents have options! Vitamin D drops for infants until when? Continue until your baby is eating a lot of solids foods including sources of vitamin D.
This happens around 2 years of age, when your baby has adopted a balanced “adult” diet, with 3 meals a days and snacks. Dairy products made with fortified milk. 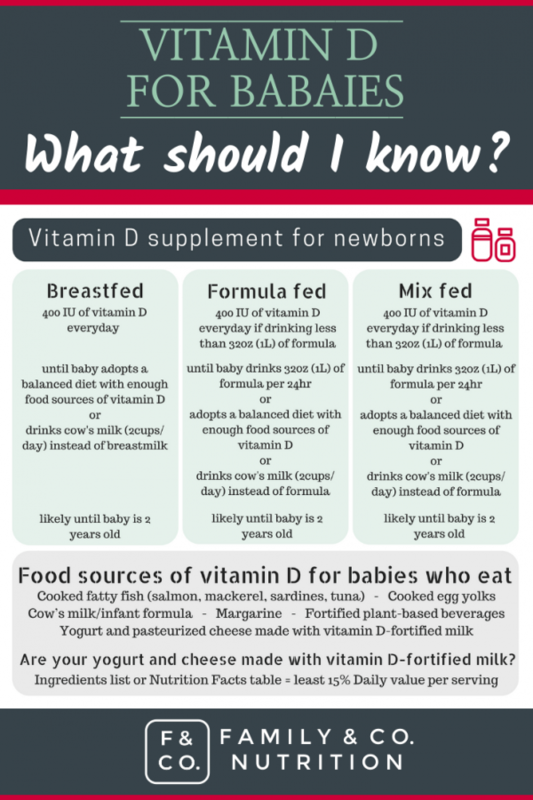 Besides eating a variety of solid foods 3 times a day, if your baby is drinking mostly cow’s milk (or formula, or a fortified plant-based milk) you can stop the vitamin D supplement. If you are still offering only breastmilk, continue with the supplement of vitamin D.
Offer a vitamin D supplement until baby eats a balanced diet, likely around 2 years of age. Does more vitamin D = better? Don’t worry if you gave too much with the dropper or if 2 (or 3) drops fell, it’s not a big deal! We encourage you to follow the posology and aim for 400IU/d, but nothing bad will happen overnight! But, repeated high doses of supplement can cause problems. 2,500IU/d (for babies 1-3years old). Vitamin D aids calcium absorption. Eating too much can create a buildup of calcium in baby’s body and that can be very dangerous. A lot of vitamin D research shows promise in managing or preventing different health conditions. But, to date there’s no convincing evidence of a benefit for babies to received more than 400 IU/d. Currently, there is no convincing evidence supporting doses greater than 400IU/d of vitamin D in babies, without additional risks. 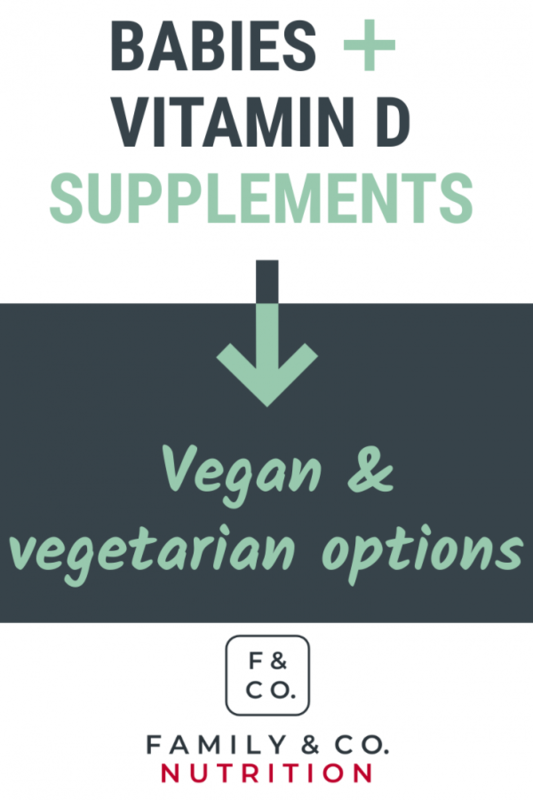 We hope this post helps you with vitamin D supplements. Feel free to ask us any questions you may have…luckily Maude is doing her PhD in vitamin D related to babies and mama! Tripkovic L et al. Comparison of vitamin D2 and vitamin D3 supplementation in raising serum 25-hydroxyvitamin D status: a systematic review and meta-analysis. The American journal of clinical nutrition. 2012 May 2;95(6):1357-64. Gallo S et al. Effect of different dosages of oral vitamin D supplementation on vitamin D status in healthy, breastfed infants: randomized trial. Jama. 2013 May 1;309(17):1785-92. Kovacs CS. Bone development and mineral homeostasis in the fetus and neonate: roles of the calciotropic and phosphotropic hormones. Physiological Reviews. 2014 Oct;94(4):1143-218. Kovacs CS. Maternal mineral and bone metabolism during pregnancy, lactation, and post-weaning recovery. Physiological reviews. 2016 Feb 17;96(2):449-547. Hollis BW et al. Maternal Versus Infant Vitamin D Supplementation During Lactation : A Randomized Controlled Trial. Pediatrics 2015;136:4.